President Bush said Hurricane Katrina was "one of the worst natural disasters in our nation's history." Tech Travel Agents want to help businesses become operational again. Tech Travel Agents have secured a 10% discount for desktop computer rentals from Rentacomputer.com for businesses relocating desktop computers due to Hurricane Katrina. 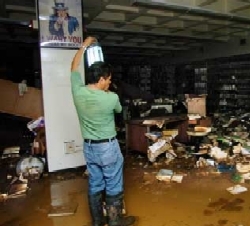 Photo: This business is flooded due to Katrina. A temporary office is being setup in a warehouse 30 miles away. Tech Travel Agent has coordinated computer rentals, printers and technical networking services. This is all happening within 48 hours of the disaster. Katrina will have an immediate and lasting effect on our economy. The economies of businesses in the path of Katrina will be damaged for years. Businesses harmed by Katrina will need to relocate at least once, possibly two or more times before they can resume permanent operations. Rent a complete wireless office including computers, printers and projectors. Setting up wireless is fast and easy. A complete office can be set up within a few business hours of your phone call. If your current business location was damaged beyond use, Tech Travel Agents from Rentacomputer.com will help with computer technology. Once you secure a location to resume your business operations, Tech Travel Agents can coordinate in delivery and setup of new and rental computer equipment, printers and networks. Engineers, cable guys and installers work together to set up your temporary or permanent facility anywhere in the United States or Canada. Everything you need to install applications and restore data from company backups and get your network back up to full speed immediately is available at Rentacomputer.com . Tech Travel Agents are available by telephone at 800-736-8772, by email TechTravelAgent@Rentacomputer.com or on the web at www.Rentacomputer.com.